Oh Fancy Custom Cabinet Doors - Kellbot! | Kellbot! 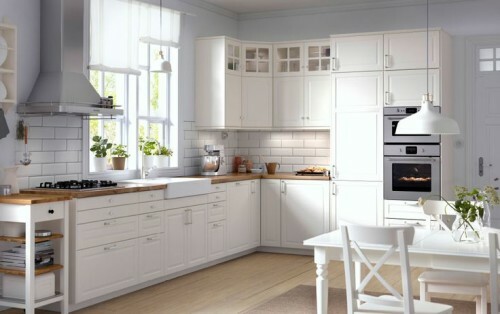 As far as default IKEA options go the only one I’m even vaguely into are the white BOBDYN doors. I don’t really have anything against the IKEA doors, except maybe the shade of “off-white” is a little too far “off” for my tastes. But really I’m splitting hairs. I just love the look of the beadboard doors. Unfortunately the quote for my beloved custom doors came in at literally twice the price of the IKEA doors. Ouch. I understand why: it’s an apples to oranges comparison. BOBDYN is made of MDF (aka particleboard) with a white veneer. Scherrs doors are solid wood. Oh, yeah, that “twice as much” quote doesn’t include painting, I’d have to do that myself (or pay extra). It’s a much smaller jump from Ikea’s solid wood doors to Scherrs. But the price gap between MDF and solid wood is significant. If we go with IKEA we’re looking at $1000 worth of doors. Even with the money we’re saving by DIYing a lot of stuff I’m just not sure I can justify shelling out an extra grand on doors. It’s not all lost yet; the Sherrs folks are looking to see if we can rework the quote to be a little more budget friendly by swapping out a few things, but at this point I’m not optimistic. At the end of the day I have to think about other things that money could go towards (like a nice stove). Overall I’ve been dealing with a lot of sticker shock over just how much all this stuff costs. I’ve never redone a kitchen before – both the condo and our current place had nice kitchens when we moved in. This stuff is nuts. Right now we’re looking at spending almost $14k on a 10′ x 10′ kitchen, using mid-grade stuff (except those countertops; I will die for my quartz countertops) and DIYing all we can. So yeah kitchens are insane. Update 3/27: it turns out I can’t read. The new quote came in much lower, and then I realized I’d misread the original quote. I did not notice the 25% discount applied, which cut the price of the doors by $500. So the solid-wood doors are still 50% more than the ikea MDF but… maybe it’s worth it? As an Obot, I am not too pleased you are throwing some cold hard reality on the birthers' mir&h.Itt#39;s far more entertaining to watch everyone gloat about the default judgment they believe will become of a simple denial of a motion to quash for failure to state the factual and legal support necessary for the judge to support his ruling in the inevitable appellate review.So stop it, Dean. You are spoiling all the fun with your insightful analysis.